A member of the platinum group metals, iridium is white, resembling platinum, but with a slight yellowish cast. Because of its hardness, brittleness, and very high melting point, solid iridium is difficult to machine, form, or work; thus powder metallurgy is commonly employed instead. It is the only metal to maintain good mechanical properties in air at temperatures above 1,600 °C (2,910 °F). It has the 10th highest boiling point among all elements and becomes a superconductor at temperatures below 0.14 K.
Iridium's modulus of elasticity is the second-highest among the metals, only being surpassed by osmium. This, together with a high shear modulus and a very low figure for Poisson's ratio (the relationship of longitudinal to lateral strain), indicate the high degree of stiffness and resistance to deformation that have rendered its fabrication into useful components a matter of great difficulty. Despite these limitations and iridium's high cost, a number of applications have developed where mechanical strength is an essential factor in some of the extremely severe conditions encountered in modern technology. The measured density of iridium is only slightly lower (by about 0.12%) than that of osmium, the densest metal known. Some ambiguity occurred regarding which of the two elements was denser, due to the small size of the difference in density and difficulties in measuring it accurately, but, with increased accuracy in factors used for calculating density X-ray crystallographic data yielded densities of 22.56 g/cm3 for iridium and 22.59 g/cm3 for osmium. Iridium is the most corrosion-resistant metal known: it is not attacked by almost any acid, aqua regia, molten metals, or silicates at high temperatures. It can, however, be attacked by some molten salts, such as sodium cyanide and potassium cyanide, as well as oxygen and the halogens (particularly fluorine) at higher temperatures. Iridium also reacts directly with sulfur at atmospheric pressure to yield iridium disulfide. 4; it is only known as gas-phase species and is not known to form any salts. 3, which can be prepared from the reaction of potassium oxide or potassium superoxide with iridium at high temperatures. 6. Iridium(III) complexes are diamagnetic (low-spin) and generally have an octahedral molecular geometry. 2. Another one is Crabtree's catalyst, a homogeneous catalyst for hydrogenation reactions. These compounds are both square planar, d8 complexes, with a total of 16 valence electrons, which accounts for their reactivity. An iridium-based organic LED material has been documented, and found to be much brighter than DPA or PPV, so could be the basis for flexible OLED lighting in the future. Iridium has two naturally occurring, stable isotopes, 191Ir and 193Ir, with natural abundances of 37.3% and 62.7%, respectively. At least 37 radioisotopes have also been synthesized, ranging in mass number from 164 to 202. 192Ir, which falls between the two stable isotopes, is the most stable radioisotope, with a half-life of 73.827 days, and finds application in brachytherapy and in industrial radiography, particularly for nondestructive testing of welds in steel in the oil and gas industries; iridium-192 sources have been involved in a number of radiological accidents. Three other isotopes have half-lives of at least a day—188Ir, 189Ir, and 190Ir. Isotopes with masses below 191 decay by some combination of β+ decay, α decay, and (rare) proton emission, with the exceptions of 189Ir, which decays by electron capture. Synthetic isotopes heavier than 191 decay by β− decay, although 192Ir also has a minor electron capture decay path. All known isotopes of iridium were discovered between 1934 and 2008, with the most recent discoveries being 200-202Ir. The discovery of iridium is intertwined with that of platinum and the other metals of the platinum group. Native platinum used by ancient Ethiopians and by South American cultures always contained a small amount of the other platinum group metals, including iridium. Platinum reached Europe as platina ("silverette"), found in the 17th century by the Spanish conquerors in a region today known as the department of Chocó in Colombia. The discovery that this metal was not an alloy of known elements, but instead a distinct new element, did not occur until 1748. 2O) by a sequence of reactions with sodium hydroxide and hydrochloric acid. He named iridium after Iris (Ἶρις), the Greek winged goddess of the rainbow and the messenger of the Olympian gods, because many of the salts he obtained were strongly colored. [note 2] Discovery of the new elements was documented in a letter to the Royal Society on June 21, 1804. 2 gas for each kilogram of iridium. These extreme difficulties in melting the metal limited the possibilities for handling iridium. John Isaac Hawkins was looking to obtain a fine and hard point for fountain pen nibs, and in 1834 managed to create an iridium-pointed gold pen. In 1880, John Holland and William Lofland Dudley were able to melt iridium by adding phosphorus and patented the process in the United States; British company Johnson Matthey later stated they had been using a similar process since 1837 and had already presented fused iridium at a number of World Fairs. The first use of an alloy of iridium with ruthenium in thermocouples was made by Otto Feussner in 1933. These allowed for the measurement of high temperatures in air up to 2000 °C. In Munich, Germany in 1957 Rudolf Mössbauer, in what has been called one of the "landmark experiments in twentieth-century physics", discovered the resonant and recoil-free emission and absorption of gamma rays by atoms in a solid metal sample containing only 191Ir. This phenomenon, known as the Mössbauer effect (which has since been observed for other nuclei, such as 57Fe), and developed as Mössbauer spectroscopy, has made important contributions to research in physics, chemistry, biochemistry, metallurgy, and mineralogy. Mössbauer received the Nobel Prize in Physics in 1961, at the age 32, just three years after he published his discovery. In 1986 Rudolf Mössbauer was honored for his achievements with the Albert Einstein Medal and the Elliot Cresson Medal. Iridium is one of the nine least abundant stable elements in Earth's crust, having an average mass fraction of 0.001 ppm in crustal rock; platinum is 10 times more abundant, gold is 40 times more abundant, and silver and mercury are 80 times more abundant. Tellurium is about as abundant as iridium. In contrast to its low abundance in crustal rock, iridium is relatively common in meteorites, with concentrations of 0.5 ppm or more. The overall concentration of iridium on Earth is thought to be much higher than what is observed in crustal rocks, but because of the density and siderophilic ("iron-loving") character of iridium, it descended below the crust and into Earth's core when the planet was still molten. 2). In all of these compounds, platinum is exchanged by a small amount of iridium and osmium. As with all of the platinum group metals, iridium can be found naturally in alloys with raw nickel or raw copper. A number of iridium-dominant minerals, with iridium as the species-forming element, are known. They are exceedingly rare and often represent the iridium analogues of the above-given ones. The examples are irarsite and cuproiridsite, to mention some. Within Earth's crust, iridium is found at highest concentrations in three types of geologic structure: igneous deposits (crustal intrusions from below), impact craters, and deposits reworked from one of the former structures. The largest known primary reserves are in the Bushveld igneous complex in South Africa, (near the largest known impact crater, the Vredefort crater) though the large copper–nickel deposits near Norilsk in Russia, and the Sudbury Basin (also an impact crater) in Canada are also significant sources of iridium. Smaller reserves are found in the United States. Iridium is also found in secondary deposits, combined with platinum and other platinum group metals in alluvial deposits. The alluvial deposits used by pre-Columbian people in the Chocó Department of Colombia are still a source for platinum-group metals. As of 2003, world reserves have not been estimated. The [Cretaceous–Paleogene boundary] of 66 million years ago, marking the temporal border between the Cretaceous and Paleogene periods of geological time, was identified by a thin stratum of iridium-rich clay. A team led by Luis Alvarez proposed in 1980 an extraterrestrial origin for this iridium, attributing it to an asteroid or comet impact. Their theory, known as the Alvarez hypothesis, is now widely accepted to explain the extinction of the non-avian dinosaurs. A large buried impact crater structure with an estimated age of about 66 million years was later identified under what is now the Yucatán Peninsula (the Chicxulub crater). Dewey M. McLean and others argue that the iridium may have been of volcanic origin instead, because Earth's core is rich in iridium, and active volcanoes such as Piton de la Fournaise, in the island of Réunion, are still releasing iridium. Iridium is also obtained commercially as a by-product from nickel and copper mining and processing. During electrorefining of copper and nickel, noble metals such as silver, gold and the platinum group metals as well as selenium and tellurium settle to the bottom of the cell as anode mud, which forms the starting point for their extraction. To separate the metals, they must first be brought into solution. Several separation methods are available depending on the nature of the mixture; two representative methods are fusion with sodium peroxide followed by dissolution in aqua regia, and dissolution in a mixture of chlorine with hydrochloric acid. 6 with organic amines. The first method is similar to the procedure Tennant and Wollaston used for their separation. The second method can be planned as continuous liquid–liquid extraction and is therefore more suitable for industrial scale production. In either case, the product is reduced using hydrogen, yielding the metal as a powder or sponge that can be treated using powder metallurgy techniques. Iridium prices have fluctuated over a considerable range. With a relatively small volume in the world market (compared to other industrial metals like aluminium or copper), the iridium price reacts strongly to instabilities in production, demand, speculation, hoarding, and politics in the producing countries. As a substance with rare properties, its price has been particularly influenced by changes in modern technology: The gradual decrease between 2001 and 2003 has been related to an oversupply of Ir crucibles used for industrial growth of large single crystals. Likewise the prices above 1000 USD/oz between 2010 and 2014 have been explained with the installation of production facilities for single crystal sapphire used in LED backlights for TVs. The demand for iridium surged from 2.5 tonnes in 2009 to 10.4 tonnes in 2010, mostly because of electronics-related applications that saw a rise from 0.2 to 6 tonnes – iridium crucibles are commonly used for growing large high-quality single crystals, demand for which has increased sharply. This increase in iridium consumption is predicted to saturate due to accumulating stocks of crucibles, as happened earlier in the 2000s. Other major applications include spark plugs that consumed 0.78 tonnes of iridium in 2007, electrodes for the chloralkali process (1.1 t in 2007) and chemical catalysts (0.75 t in 2007). The high melting point, hardness and corrosion resistance of iridium and its alloys determine most of its applications. Iridium (or sometimes platinum alloys or osmium) and mostly iridium alloys have a low wear and are used, for example, for multi-pored spinnerets, through which a plastic polymer melt is extruded to form fibers, such as rayon. 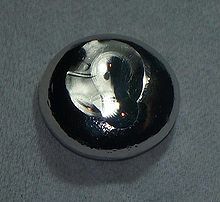 Osmium–iridium is used for compass bearings and for balances. Their resistance to arc erosion makes iridium alloys ideal for electrical contacts for spark plugs, and iridium-based spark plugs are particularly used in aviation. Pure iridium is extremely brittle, to the point of being hard to weld because the heat-affected zone cracks, but it can be made more ductile by addition of small quantities of titanium and zirconium (0.2% of each apparently works well). Corrosion and heat resistance makes iridium an important alloying agent. Certain long-life aircraft engine parts are made of an iridium alloy, and an iridium–titanium alloy is used for deep-water pipes because of its corrosion resistance. 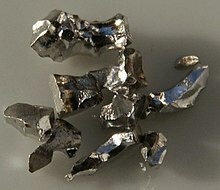 Iridium is also used as a hardening agent in platinum alloys. The Vickers hardness of pure platinum is 56 HV, whereas platinum with 50% of iridium can reach over 500 HV. Devices that must withstand extremely high temperatures are often made from iridium. For example, high-temperature crucibles made of iridium are used in the Czochralski process to produce oxide single-crystals (such as sapphires) for use in computer memory devices and in solid state lasers. The crystals, such as gadolinium gallium garnet and yttrium gallium garnet, are grown by melting pre-sintered charges of mixed oxides under oxidizing conditions at temperatures up to 2100 °C. Iridium compounds are used as catalysts in the Cativa process for carbonylation of methanol to produce acetic acid. The radioisotope iridium-192 is one of the two most important sources of energy for use in industrial γ-radiography for non-destructive testing of metals. Additionally, 192Ir is used as a source of gamma radiation for the treatment of cancer using brachytherapy, a form of radiotherapy where a sealed radioactive source is placed inside or next to the area requiring treatment. Specific treatments include high-dose-rate prostate brachytherapy, bilary duct brachytherapy, and intracavitary cervix brachytherapy. In February 2019, medical scientists announced that iridium attached to albumin, creating a photosensitized molecule, can penetrate cancer cells and, after being irradiated with light (a process called photodynamic therapy), destroy the cancer cells. An alloy of 90% platinum and 10% iridium was used in 1889 to construct the International Prototype Metre and kilogram mass, kept by the International Bureau of Weights and Measures near Paris. The meter bar was replaced as the definition of the fundamental unit of length in 1960 by a line in the atomic spectrum of krypton,[note 3] but the kilogram prototype is still the international standard of mass (until 20 May 2019). Another use concerns X-ray optics, especially X-ray telescopes. The mirrors of the Chandra X-ray Observatory are coated with a layer of iridium 60 nm thick. Iridium proved to be the best choice for reflecting X-rays after nickel, gold, and platinum were also tested. The iridium layer, which had to be smooth to within a few atoms, was applied by depositing iridium vapor under high vacuum on a base layer of chromium. Iridium–osmium alloys were used in fountain pen nib tips. The first major use of iridium was in 1834 in nibs mounted on gold. Since 1944, the famous Parker 51 fountain pen was fitted with a nib tipped by a ruthenium and iridium alloy (with 3.8% iridium). The tip material in modern fountain pens is still conventionally called "iridium", although there is seldom any iridium in it; other metals such as ruthenium, osmium and tungsten have taken its place. Iridium in bulk metallic form is not biologically important or hazardous to health due to its lack of reactivity with tissues; there are only about 20 parts per trillion of iridium in human tissue. Like most metals, finely divided iridium powder can be hazardous to handle, as it is an irritant and may ignite in air. Very little is known about the toxicity of iridium compounds, because they are used in very small amounts, but soluble salts, such as the iridium halides, could be hazardous due to elements other than iridium or due to iridium itself. However, most iridium compounds are insoluble, which makes absorption into the body difficult. Ir can increase the risk of cancer. External exposure can cause burns, radiation poisoning, and death. Ingestion of 192Ir can burn the linings of the stomach and the intestines. 192Ir, 192mIr, and 194mIr tend to deposit in the liver, and can pose health hazards from both gamma and beta radiation. 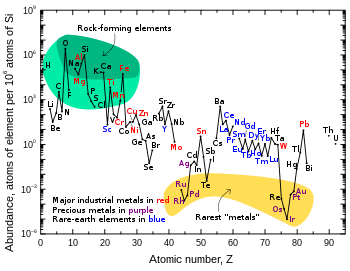 ^ Most common oxidation states of iridium are in bold. The right column lists one representative compound for each oxidation state. ^ Iridium literally means "of rainbows". ^ The definition of the meter was changed again in 1983. The meter is currently defined as the distance traveled by light in a vacuum during a time interval of ​1⁄299,792,458 of a second. ^ a b c d Wang, Guanjun; Zhou, Mingfei; Goettel, James T.; Schrobilgen, Gary G.; Su, Jing; Li, Jun; Schlöder, Tobias; Riedel, Sebastian (2014). "Identification of an iridium-containing compound with a formal oxidation state of IX". Nature. 514: 475–477. Bibcode:2014Natur.514..475W. doi:10.1038/nature13795. PMID 25341786. ^ Becker, Luann (2002). "Repeated Blows" (PDF). Scientific American. 286 (3): 77–83. Bibcode:2002SciAm.286c..76B. doi:10.1038/scientificamerican0302-76. Retrieved January 19, 2016. ^ a b c d e f g h i j k l m n Greenwood, N. N.; Earnshaw, A. (1997). Chemistry of the Elements (2nd ed.). Oxford: Butterworth–Heinemann. pp. 1113–1143, 1294. ISBN 978-0-7506-3365-9. OCLC 213025882. ^ a b c d e f g h i j k l m n o Hunt, L. B. (1987). "A History of Iridium" (PDF). Platinum Metals Review. 31 (1): 32–41. ^ Kittel, C. (2004). Introduction to Solid state Physics (7th ed.). Wiley-India. ISBN 978-81-265-1045-0. ^ Cotton, Simon (1997). Chemistry of Precious Metals. Springer-Verlag New York, LLC. p. 78. ISBN 978-0-7514-0413-5. ^ Lide, D. R. (1990). CRC Handbook of Chemistry and Physics (70th ed.). Boca Raton (FL):CRC Press. ^ a b c d e f g h i j Emsley, J. (2003). "Iridium". Nature's Building Blocks: An A–Z Guide to the Elements. Oxford, England, UK: Oxford University Press. pp. 201–204. ISBN 978-0-19-850340-8. ^ a b Perry, D. L. (1995). Handbook of Inorganic Compounds. CRC Press. pp. 203–204. ISBN 978-1439814611. ^ Lagowski, J. J., ed. (2004). Chemistry Foundations and Applications. 2. Thomson Gale. pp. 250–251. ISBN 978-0028657233. ^ Gong, Y.; Zhou, M.; Kaupp, M.; Riedel, S. (2009). "Formation and Characterization of the Iridium Tetroxide Molecule with Iridium in the Oxidation State +VIII". Angewandte Chemie International Edition. 48 (42): 7879–7883. doi:10.1002/anie.200902733. PMID 19593837. ^ Gulliver, D. J.; Levason, W. (1982). "The chemistry of ruthenium, osmium, rhodium, iridium, palladium and platinum in the higher oxidation states". Coordination Chemistry Reviews. 46: 1–127. doi:10.1016/0010-8545(82)85001-7. ^ Holleman, A. F.; Wiberg, E.; Wiberg, N. (2001). Inorganic Chemistry (1st ed.). Academic Press. ISBN 978-0-12-352651-9. OCLC 47901436. ^ a b c d e Renner, H.; Schlamp, G.; Kleinwächter, I.; Drost, E.; Lüschow, H. M.; Tews, P.; Panster, P.; Diehl, M.; et al. (2002). "Platinum group metals and compounds". Ullmann's Encyclopedia of Industrial Chemistry. Wiley. doi:10.1002/14356007.a21_075. ISBN 978-3527306732. ^ Vaska, L.; DiLuzio, J.W. (1961). "Carbonyl and Hydrido-Carbonyl Complexes of Iridium by Reaction with Alcohols. Hydrido Complexes by Reaction with Acid". Journal of the American Chemical Society. 83 (12): 2784–2785. doi:10.1021/ja01473a054. ^ Crabtree, R. H. (1979). "Iridium compounds in catalysis". Accounts of Chemical Research. 12 (9): 331–337. doi:10.1021/ar50141a005. ^ Crabtree, R. H. (2005). The Organometallic Chemistry of the Transition Metals (PDF). Wiley. ISBN 978-0471662563. OCLC 224478241. Archived from the original (PDF) on 2012-11-19. ^ a b c Mager Stellman, J. (1998). "Iridium". Encyclopaedia of Occupational Health and Safety. International Labour Organization. p. 63.19. ISBN 978-92-2-109816-4. OCLC 35279504. ^ Robinson, R.; Thoennessen, M. (2012). "Discovery of tantalum, rhenium, osmium, and iridium isotopes". Atomic Data and Nuclear Data Tables. 98 (5): 911–932. arXiv:1109.0526. doi:10.1016/j.adt.2011.09.003. ^ a b Chereminisoff, N. P. (1990). Handbook of Ceramics and Composites. CRC Press. p. 424. ISBN 978-0-8247-8006-7. ^ Ogden, J. M. (1976). "The So-Called 'Platinum' Inclusions in Egyptian Goldwork". The Journal of Egyptian Archaeology. 62: 138–144. doi:10.2307/3856354. JSTOR 3856354. ^ Chaston, J. C. (1980). "The Powder Metallurgy of Platinum" (PDF). Platinum Metals Rev. 24 (21): 70–79. ^ McDonald, M. (1959). "The Platinum of New Granada: Mining and Metallurgy in the Spanish Colonial Empire". Platinum Metals Review. 3 (4): 140–145. ^ Weeks, M. E. (1968). Discovery of the Elements (7th ed.). Journal of Chemical Education. pp. 414–418. ISBN 978-0-8486-8579-9. OCLC 23991202. ^ Tennant, S. (1804). "On Two Metals, Found in the Black Powder Remaining after the Solution of Platina". Philosophical Transactions of the Royal Society of London. 94: 411–418. doi:10.1098/rstl.1804.0018. JSTOR 107152. ^ Trigg, G. L. (1995). Landmark Experiments in Twentieth Century Physics. Courier Dover Publications. pp. 179–190. ISBN 978-0-486-28526-9. OCLC 31409781. ^ Mössbauer, R. L. (1958). "Gammastrahlung in Ir191". Zeitschrift für Physik A (in German). 151 (2): 124–143. Bibcode:1958ZPhy..151..124M. doi:10.1007/BF01344210. ^ Waller, I. (1964). "The Nobel Prize in Physics 1961: presentation speech". Nobel Lectures, Physics 1942–1962. Elsevier. ^ Scott, E. R. D.; Wasson, J. T.; Buchwald, V. F. (1973). 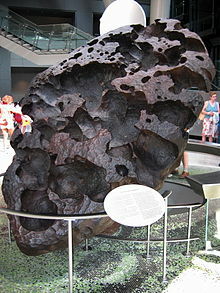 "The chemical classification of iron meteorites—VII. A reinvestigation of irons with Ge concentrations between 25 and 80 ppm". Geochimica et Cosmochimica Acta. 37 (8): 1957–1983. Bibcode:1973GeCoA..37.1957S. doi:10.1016/0016-7037(73)90151-8. ^ a b "Iridium" (PDF). Human Health Fact Sheet. Argonne National Laboratory. 2005. Archived from the original (PDF) on March 4, 2012. Retrieved 2008-09-20. ^ "Irarsite: Mineral information, data and localities". www.mindat.org. ^ "Iridium: The mineralogy of Iridium". www.mindat.org. ^ "International Mineralogical Association - Commission on New Minerals, Nomenclature and Classification". nrmima.nrm.se. ^ a b c d Seymour, R. J.; O'Farrelly, J. I. (2001). "Platinum-group metals". Kirk Othmer Encyclopedia of Chemical Technology. Wiley. doi:10.1002/0471238961.1612012019052513.a01.pub2. ISBN 978-0471238966. ^ a b Alvarez, L. W.; Alvarez, W.; Asaro, F.; Michel, H. V. (1980). "Extraterrestrial cause for the Cretaceous–Tertiary extinction" (PDF). Science. 208 (4448): 1095–1108. Bibcode:1980Sci...208.1095A. CiteSeerX 10.1.1.126.8496. doi:10.1126/science.208.4448.1095. PMID 17783054. ^ Hildebrand, A. R.; Penfield, Glen T.; Kring, David A.; Pilkington, Mark; Zanoguera, Antonio Camargo; Jacobsen, Stein B.; Boynton, William V. (1991). "Chicxulub Crater; a possible Cretaceous/Tertiary boundary impact crater on the Yucatan Peninsula, Mexico". Geology. 19 (9): 867–871. Bibcode:1991Geo....19..867H. doi:10.1130/0091-7613(1991)019<0867:CCAPCT>2.3.CO;2. ^ Frankel, C. (1999). The End of the Dinosaurs: Chicxulub Crater and Mass Extinctions. Cambridge University Press. ISBN 978-0-521-47447-4. OCLC 40298401. ^ Ryder, G.; Fastovsky, D. E.; Gartner, S. (1996). The Cretaceous-Tertiary Event and Other Catastrophes in Earth History. Geological Society of America. p. 47. ISBN 978-0-8137-2307-5. ^ Toutain, J.-P.; Meyer, G. (1989). "Iridium-Bearing Sublimates at a Hot-Spot Volcano (Piton De La Fournaise, Indian Ocean)". Geophysical Research Letters. 16 (12): 1391–1394. Bibcode:1989GeoRL..16.1391T. doi:10.1029/GL016i012p01391. ^ Ohriner, E. K. (2008). "Processing of Iridium and Iridium Alloys". Platinum Metals Review. 52 (3): 186–197. doi:10.1595/147106708X333827. ^ Hagelüken, C. (2006). "Markets for the catalysts metals platinum, palladium, and rhodium" (PDF). Metall. 60 (1–2): 31–42. Archived from the original (PDF) on March 4, 2009. ^ "Platinum 2013 Interim Review" (PDF). Platinum Today. Johnson Matthey Plc. Retrieved 2014-01-10. ^ Jollie, D. (2008). Platinum 2008 (PDF). Johnson Matthey. ISSN 0268-7305. Retrieved 2008-10-13. ^ Egorova, R. V.; Korotkov, B. V.; Yaroshchuk, E. G.; Mirkus, K. A.; Dorofeev N. A.; Serkov, A. T. (1979). "Spinnerets for viscose rayon cord yarn". Fibre Chemistry. 10 (4): 377–378. doi:10.1007/BF00543390. ^ Emsley, J. (2005-01-18). "Iridium" (PDF). Visual Elements Periodic Table. Royal Society of Chemistry. Retrieved 2008-09-17. ^ a b Handley, J. R. (1986). "Increasing Applications for Iridium" (PDF). Platinum Metals Review. 30 (1): 12–13. ^ Stallforth, H.; Revell, P. A. (2000). Euromat 99. Wiley-VCH. ISBN 978-3-527-30124-9. ^ Darling, A. S. (1960). "Iridium Platinum Alloys" (PDF). Platinum Metals Review. 4 (l): 18–26. Bibcode:1960Natur.186Q.211.. doi:10.1038/186211a0. Retrieved 2008-10-13. ^ Biggs, T.; Taylor, S. S.; van der Lingen, E. (2005). "The Hardening of Platinum Alloys for Potential Jewellery Application". Platinum Metals Review. 49 (1): 2–15. doi:10.1595/147106705X24409. ^ Crookes, W. (1908). "On the Use of Iridium Crucibles in Chemical Operations". Proceedings of the Royal Society of London. Series A, Containing Papers of a Mathematical and Physical Character. 80 (541): 535–536. Bibcode:1908RSPSA..80..535C. doi:10.1098/rspa.1908.0046. JSTOR 93031. ^ Cheung, H.; Tanke, R. S.; Torrence, G. P. (2000). "Acetic acid". Ullmann's Encyclopedia of Industrial Chemistry. Wiley. doi:10.1002/14356007.a01_045. ISBN 978-3527306732. ^ Halmshaw, R. (1954). "The use and scope of Iridium 192 for the radiography of steel". British Journal of Applied Physics. 5 (7): 238–243. Bibcode:1954BJAP....5..238H. doi:10.1088/0508-3443/5/7/302. ^ Hellier, Chuck (2001). Handbook of Nondestructive Evlaluation. The McGraw-Hill Companies. ISBN 978-0-07-028121-9. ^ University of Warwick (3 February 2019). "Simply shining light on dinosaur metal compound kills cancer cells". EurekAlert!. Retrieved 3 February 2019. ^ Zhang, Pingyu; et al. (15 December 2018). "Nucleus‐Targeted Organoiridium–Albumin Conjugate for Photodynamic Cancer Therapy". Angewandte Chemie. doi:10.1002/anie.201813002. ^ Penzes, W. B. (2001). "Time Line for the Definition of the Meter". National Institute for Standards and Technology. Retrieved 2008-09-16. ^ Ziegler, E.; Hignette, O.; Morawe, Ch. ; Tucoulou, R. (2001). "High-efficiency tunable X-ray focusing optics using mirrors and laterally-graded multilayers". Nuclear Instruments and Methods in Physics Research Section A: Accelerators, Spectrometers, Detectors and Associated Equipment. 467–468 (2002): 954–957. Bibcode:2001NIMPA.467..954Z. doi:10.1016/S0168-9002(01)00533-2. ^ "Face-to-Face with Jerry Johnston, CXC Program Manager & Bob Hahn, Chief Engineer at Optical Coating Laboratories, Inc., Santa Rosa, CA". Harvard-Smithsonian Center for Astrophysics; Chandra X-ray Center. 1995. Retrieved 2008-09-24. ^ Möhl, D. (1997). "Production of low-energy antiprotons". Zeitschrift Hyperfine Interactions. 109 (1–4): 33–41. Bibcode:1997HyInt.109...33M. doi:10.1023/A:1012680728257. ^ a b Janowicz, A. H.; Bergman, R. G. (1982). "Carbon-hydrogen activation in completely saturated hydrocarbons: direct observation of M + R-H → M(R)(H)". Journal of the American Chemical Society. 104 (1): 352–354. doi:10.1021/ja00365a091. ^ a b Hoyano, J. K.; Graham, W. A. G. (1982). "Oxidative addition of the carbon-hydrogen bonds of neopentane and cyclohexane to a photochemically generated iridium(I) complex". Journal of the American Chemical Society. 104 (13): 3723–3725. doi:10.1021/ja00377a032. ^ Källström, K; Munslow, I; Andersson, P G (2006). "Ir-catalysed asymmetric hydrogenation: Ligands, substrates and mechanism". Chemistry: A European Journal. 12 (12): 3194–3200. doi:10.1002/chem.200500755. PMID 16304642. ^ Roseblade, S. J.; Pfaltz, A. (2007). "Iridium-catalyzed asymmetric hydrogenation of olefins". Accounts of Chemical Research. 40 (12): 1402–1411. doi:10.1021/ar700113g. PMID 17672517. ^ Wang, X.; Andersson, M. R.; Thompson, M. E.; Inganäsa, O. (2004). "Electrophosphorescence from substituted poly(thiophene) doped with iridium or platinum complex". Thin Solid Films. 468 (1–2): 226–233. Bibcode:2004TSF...468..226W. doi:10.1016/j.tsf.2004.05.095. ^ Tonzetich, Zachary J. (2002). "Organic Light Emitting Diodes—Developing Chemicals to Light the Future" (PDF). Journal of Undergraduate Research. Rochester University. 1 (1). Retrieved 2008-10-10. ^ Holder, E.; Langefeld, B. M. W.; Schubert, U. S. (2005-04-25). "New Trends in the Use of Transition Metal-Ligand Complexes for Applications in Electroluminescent Devices". Advanced Materials. 17 (9): 1109–1121. doi:10.1002/adma.200400284. ^ Crookes, W., ed. (1867). "The Paris Exhibition". The Chemical News and Journal of Physical Science. XV: 182. ^ Pepper, J. H. (1861). The Playbook of Metals: Including Personal Narratives of Visits to Coal, Lead, Copper, and Tin Mines, with a Large Number of Interesting Experiments Relating to Alchemy and the Chemistry of the Fifty Metallic Elements. Routledge, Warne, and Routledge. p. 455. ^ "Radioisotope Brief: Iridium-192 (Ir-192)" (PDF). Radiation Emergencies. Centers for Disease Control and Prevention. 2004-08-18. Retrieved 2008-09-20. Wikimedia Commons has media related to Iridium.